– ~ Please note that Sketch Tuesdays at 111 Minna Gallery will not be held every third Tuesday of the month as in the past, but it WILL take place on a certain Tuesday every month. Check here on Fecalface.com to find out when the event is happening, or on the sweet newly re-done 111 site. During the event we will be having ‘THE FIVE MINUTE ARTIST TALK’. ‘THE FIVE MINUTE ARTIST TALK’ is where our invited artist can describe her/his creative process, influences, or just take five minutes to talk about the president(s). This month’s talk will be Kris D., co-curator of the current monthly group show titled “365” at 111 Minna; if you missed the opening reception this is a nice chance for you to see the exhibit. Admission is FREE, but 21+ and no babies, please. 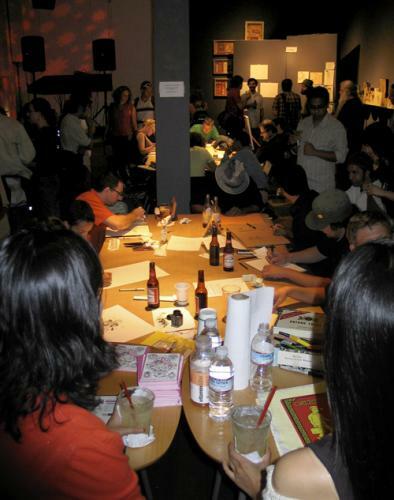 111 Minna Gallery is pleased to announce the fifth ‘Sketch Tuesdays’ event of 2008. Each month the gallery hosts an evening of live art making featuring both established and emerging Bay Area artists. Inspired by Southern Exposure’s Monster Drawing Rally, 111 Minna offers patrons the opportunity to see local artists at work and get acquainted with them. It is also a way for artists to meet each other and to be inspired by each other’s creative process. Sketch Tuesdays offers the local arts community a place to congregate, to talk, to create and to be seen. There is usually room for artists to just drop in and start drawing, but the good seats are reserved for the invited artists. Art is for sale at reasonable prices and will be displayed until the event closes. SAN FRANCISCO IN SACRAMENTO 2, curated by abstract painter Rene Fressola, Brooklyn boy extaordinaire. Went out to Sacto this weekend for a group art show at Deep Gallery. Every second Saturday plenty of people visit the downtown area to checkout lots of art in Old Town Sacramento. Here are a couple of reworks I made for the show. Figurative charcoal drawings with guoache paint on charcoal drawing paper/wood and resin. No Digital this time! Finished a collaboration with THE LOVE MOVEMENT. An art panel that will raise money to help a small village in Benin Africa. Just a small gesture of how artists can really make a change in this world. “100 percent of the profits will go to buying suppliesfor the children of Benin. Each artist will be able to use his/her portion of money raised by the piece and decide what to send the children whether it be art supplies, soccer balls, clothing, nutrition, books etc. I wanted to touch on the controversy of cloning and how Dolly was the premiere science experiment that has launched mankind to pass a bill for production of cloned meats. Dolly is the only other mammal, other than Jesus Christ, to be conceived without a father or through sexual means. Here she is depicted as walking on water in her afterlife.